A team of PFC-funded scientists from JQI has leveraged atoms’ inherent quantum features to allow neighbors in an atomic lattice to get closer than ever before. The new technique manages to squeeze the ordinary gentle hills of an optical lattice into steep walls separated by only one-fiftieth of the laser’s wavelength—25 times narrower than possible with conventional methods. In most optical lattices, atoms are arranged by repeating smooth dips in the intensity of laser light—a mechanism that also works with non-quantum objects like bacteria or even glass beads. But this ignores many inherent quantum characteristics of the atoms. Unlike glass beads, atoms, prompted by laser light of certain colors, can internally switch between different quantum versions of themselves, called states. The team exploits this property to build lattices that effectively replace the rolling hills with spiky features. To create this lattice, the researchers ensnare the atoms in a two-toned light pattern. Each color is chosen so that it can change an atom’s internal state on its own, but when the two colors overlap, the more intense color at each spot takes charge and decides which internal state the atom lands in. But this pattern is not smooth—there are vast valleys where the atom prefers one state, interrupted by thin strips where it should switch. The rules of quantum mechanics dictate that every time an atom changes its state, the atom must pay a price in the form of energy, just like climbing a hill. While a smooth transition may appear as a Sunday stroll to the atom, large changes over shorter distances quickly evolve into an increasingly steep hike. 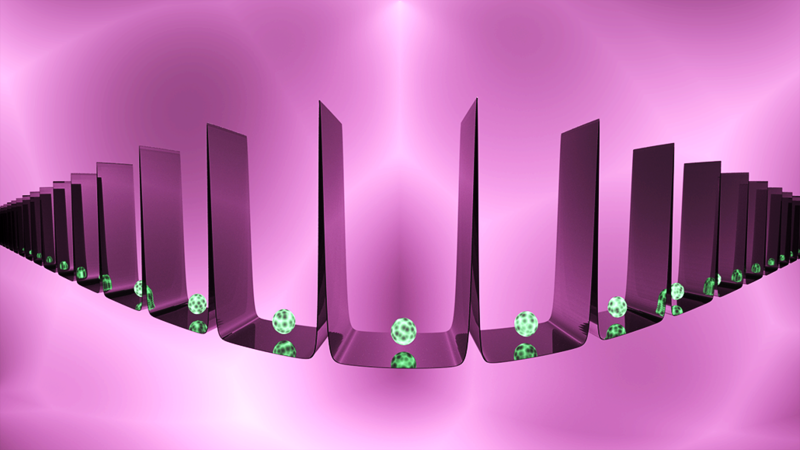 In the experiment, the thin strips inside the light pattern are so narrow, that they look like insurmountable walls to the atom, so it avoids them and gets stuck in between. The research team says that this tool may also be useful for future quantum chemistry experiments, allowing scientists to bring atoms close enough to engage in a small-scale, highly-controlled reaction.